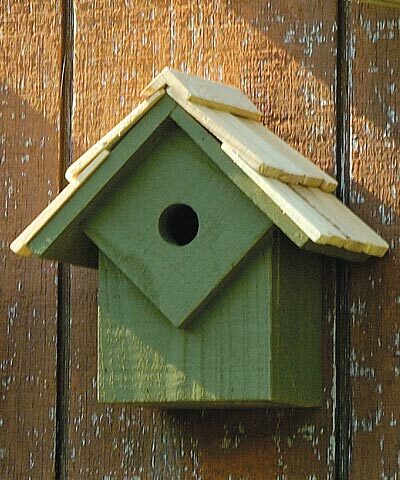 Offer a quaint nest for small birds in your garden with the Heartwood Summer Home Bird House. The peaked roof and rectangular shape of the home lend a classic feel to it, while the dark green color brings an organic look. A square predator guard surrounds the 1" diameter entrance hole, helping protect the nestlings inside and adding to the angular theme. A copper panel on the back of the home is removable for seasonal cleaning, and a metal hook attached to the back of the item allows it to be wall mounted. The cypress construction is perfect for use outdoors, and the wooden shingles add charm to the home. Add a quiet roost to your bird sanctuary with this Summer Home. Made in the USA.